Being a locally owned & operated we take pride in offering wonderful services. We love our customers & hope to make everyday filled with yummy treats! We offer a variety of services, from specialty cakes, to walk in orders. We specialize in Weddings & Custom Party Cakes, we also offer basic designs as well. We offer personal appointments for anyone looking to order. As well as delivery to your destination, whether it be a party or wedding. We offer so many options for you wedding cake, the list is endless. If you want simple, we can do a wonderful creamy buttercream with detailed design. You can go for bold & bright with flowers, bright colors, ribbons, or anything else you like. We also offer very modern designs for the modern bride. This would include different shape, sizes, colors, & textures. The possibilities are endless! Looking for something fun & exciting for your child's next birthday???? We offer some of the best designs that no one else does. Our cakes are made to match your theme. Whether its a young hip sixteen year old or a little one's first birthday. You show us the style you want and we make our magic happen! Do you want to wow everyone at your next company party?? 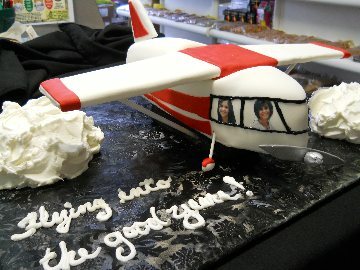 Why not bring a large detailed plane made of cake? or maybe a zombie for Halloween??? Our company offers very detailed structures made of cake. We take hours to construct our 3-D masterpieces. Each is hand crafted to exactly what you want & imagine. You are sure to "knock the socks off" everyone when they see the construction of cake, that is actually edible!! !